Welcome guests, one and all, to the Magic of the World exhibition! Come see the very first of its kind in Paris! I am your esteemed host, Eleonore Vidocq! Inquisitive minds shall find adventure here! The more you explore, the more shall be revealed! Remember, the grimoires are the key to finding the spirit gems and restoring the stone. Who among you shall be the first to experience the Otherworld? 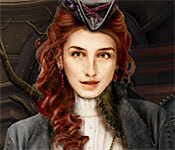 This game has a free trial version, click to start Vermillion Watch: Parisian Pursuit Game Download. If you like it, please buy the full version to support the developer, thanks.